Following 2007's critically acclaimed debut, 'Beta Male Fairytales', Ben's Brother returns with the cracking new album 'Battling Giants' through the newly founded Flat Cap Records on May 11th. After a year in which the economic climate affected people and businesses across the board, London-born Jamie Hartman felt the need to dig deep down for inspiration to write the band's 2nd album. This inspiration led him to take the very brave decision to go it alone, setting up a label to release through and working with some friends from within the songwriting world to craft some of the most catchy songs to be released this year. Ben's Brother's new album 'Battling Giants' is set to take on the music world this summer and will feature performances from Jamie's friends Joss Stone (on Stalemate) and Jason Mraz (on Battling Giants). The first single from the new album will be the incredibly infectious 'Apologise' and was co-written by Natalie Imbruglia. Says Hartman: "Something changed in my life this year - I went from searching for something to finding it. I think Battling Giants as an album is a real reflection of that. A combination of two different moods - a shift between the dark and the light. But this time it's in the right direction!" 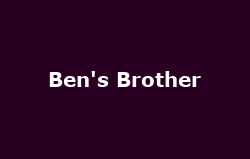 Following an album showcase gig at London's Borderline on 21st April, Ben's Brother will head out on a full UK tour in May to debut the new tracks from 'Battling Giants' alongside crowd favourites from 'Beta Male Fairytales'. Tickets for their April/ May tour cost £12.50 (unreserved) + booking.